Companies looking to position themselves as an Employer of Choice among transitioning service members may not know where to start. Just posting your jobs on a few veterans jobs sites, or saying that you want to hire veterans is not enough. Luckily, as the national interest in Veteran hiring continues to skyrocket, there are many companies who have robust Veteran hiring programs which illustrate best practices. Phillips 66, an Orion Featured Employer, is one such company. Companies aspiring to be viewed as “Military Friendly” should study their Military Talent Program and leverage the same innovative techniques. Phillips 66 split from ConocoPhillips in 2012, and as a new company, was faced with the task of putting many new processes into place, including Veteran hiring. In March 2015, Jonathan Rosenberg - Manager of Development, Talent Planning & Acquisition for Phillips 66, presented on this very topic at Orion’s National Distinguished Candidate Conference in Houston, TX. Titled “Best Practices in Military Hiring,” Rosenberg explained why he feels veterans are a good match for their company and, most importantly, how the company went about recruiting them. Phillips 66’s values of “Safety, Honor, and Commitment” tie in with the values of the military and made for a natural lead in to hiring veterans. Rosenberg also explains that hiring military has helped Phillips 66 bring a wide variety of people on board with a diversity of thought. So what blueprint led to the success of the Phillips 66 program, as evidenced by the fact that 25% of hourly workforce hires in Phillips 66’s Refining business are veterans? Here are five of the key elements of their military recruiting program. 1. Senior Leader Commitment and Internal Champions – Phillips 66’s interest in hiring veterans came from the top down, with Executives in the company taking interest and encouraging the hiring of veterans. Phillips 66 also had champions working within their refineries following up the recruiting progress. Having Hiring Managers on board is often not enough to provide the needed momentum for a sustained military recruiting program. 2. Corporate Philanthropy – Phillips 66 supports many veterans groups including, being a Chairman’s Circle member of the U.S. Chamber of Commerce Foundation’s Hiring Our Heroes and sponsoring the Military Family Research Institute at Purdue University. They list these affiliations on their website as tangible examples of their dedication. 3. Military Recruiting Firms – Phillips 66 partnered with Orion in order to scale up their veteran hiring and for the expertise a military recruiting firm brings to the process of matching veterans with civilian jobs while educating civilian companies on how to best implement a Military Talent Program. 4. Veteran-Friendly Careers websites – Both through Orion and on their website, Phillips 66 clearly communicates why they value veterans, spotlights successful veterans within the company and makes finding open positions that match a specific MOS/MOC easy. 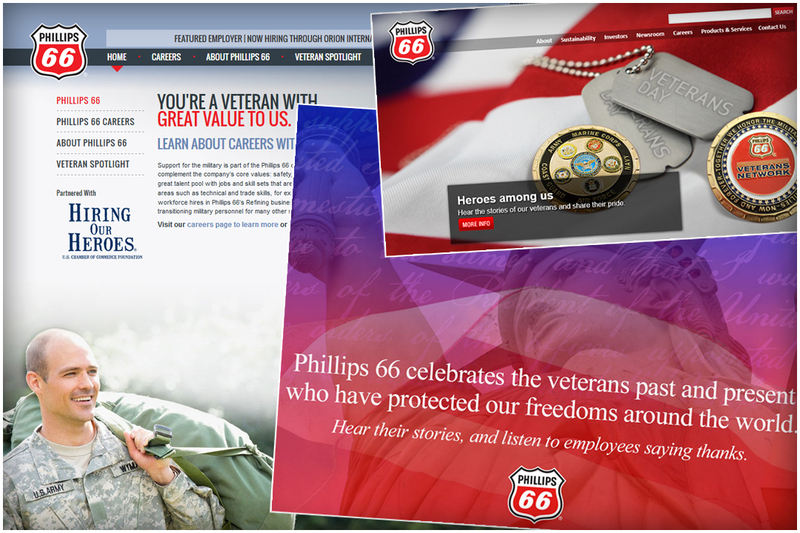 Job seekers can view videos welcoming veterans from an SVP and of veterans in action at Phillips 66. Veteran testimonials can be throughout the websites. Even though the testimonials may not be from a personal friend, hearing about the company from a fellow veteran lends credibility to the company’s claim to value veterans and provides social proof, as well as illustrates how military skills may translate to the particular careers available. Learn more about how to make a veteran-friendly website here. 5. Phillips 66 Employee Veterans Group – This group provides a way for veterans within the company to network. But this element has also been key in hiring veterans. Veterans already at Phillips 66 help bridge the gap between military candidates and civilian hiring managers, by helping go over a resume and explain what it all means or being present for military hiring events. Rosenberg explains in his talk that this was perhaps one of the most important parts of their hiring strategy. Phillips 66 has developed a great system for getting veterans in the door. They have made their available careers accessible and attractive to veterans through veteran-friendly branding and websites and have done so in a thoughtful way. Orion is proud to have worked with Phillips 66 to bring 130+ veterans on board. And while every company needs to create its own unique military recruiting program based on their needs and goals, Phillips 66’s strategy is an excellent case study in what to do right.